“Derick used to put old tea chests up for barn owls to nest in and throughout his farming life has planted a huge number of trees as well as restoring our 13 acres of ancient hanger woodland to good heart. I also grew up on a farm on chalk downland in Hampshire. My Dad had a particular meadow he was very proud of and whenever we went for walks he’d tell us what plant was what”. The farm first entered into Countryside Stewardship in 1998 and Kate became involved when they entered a Higher Level agreement with Natural England in 2009. All the arable fields have six-metre margins of long grass and the family has planted over 2,000m of hedgerow in the past 20 years. There are 97 acres of “low input” grassland, which means chemical application is limited. These are grazed by sheep, making it an ideal site for breeding lapwings from a nearby nesting plot to bring their chicks to feed. There is no shoot on the farm, but Derick puts out Larsen traps for corvids in the spring to protect nesting songbirds and has installed 10 barn owl boxes. “Our cluster has been on numerous farm walks at Rotherfield. It really is a gold-standard showcase, so when Francis came out last November, I thought his suggestions might be over the top, but they were actually very achievable. I’m a big fan of the GWCT, they can show scientific proof of how their conservation measures are benefiting wildlife and at the same time their advisors are very practical and can see things from a farming perspective. A collaborative approach is far more appealing than being dictated to”. For one of its first projects the Cluster chose to improve habitat for harvest mice, inspired by the famous 18th-century naturalist Gilbert White. White lived in nearby Selborne and identified the harvest mouse as a separate species. In 1999, only one harvest mouse nest was recorded around the village of Selborne, so after receiving tuition from GWCT, several teams went out in the winter of 2014/2015 and counted 472 separate nests across the cluster. Inspired by the project, the Faulkners decided to improve their hedgerows. One 10-yearold hawthorne hedge was straggly at the bottom and was letting the wind through at the base, so they invited Rob Nichol, local South Downs National Park ranger, to organise a weekend’s training for farmers to learn how to cut and lay hedges to provide better nesting habitat for harvest mice. If you do something for one species, it often helps others. In this case whitethroats and yellowhammers, which nest lowdown in hedgerows, now benefit from increased insect life and protection from predators. According to Kate, the farm received little recognition for its conservation work until it joined the Farmer Cluster. The resulting higher profile has enabled them to inspire others in a way that wouldn’t be possible as a single farm. For example, South Downs National Park volunteers came and finished the full length of cut-and-layed hedge started by the Cluster and the fact that the hedge was on a footpath drew in the village of Farringdon and encouraged others to get their hedges layed. In addition, a regular column in the parish magazine communicates the work of the cluster to the local community. 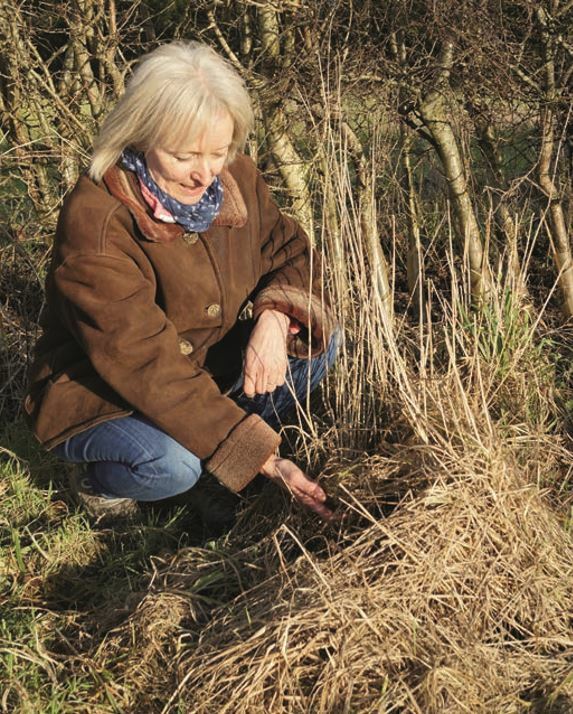 “Much of the recognition for the harvest mouse project was down to the GWCT. Peter Thompson was instrumental in getting DEFRA secretary of state Liz Truss to visit us in 2016 and that led to high profile interest from national and local papers and radio stations. We were counting our harvest mice around the time that the State of Nature report came out and I felt despondent about the reported declines in wildlife, which is a shame because there is so much going on. I worry people still think we are all ripping out hedgerows, but that hasn’t been the case since the ‘80s. There are also many environmental benefits of having more sophisticated machinery. For example, nowadays sprayers can be operated with much more precision, significantly reducing the amount of chemical used. This greater efficiency in the middle of the field allows us to have a bit more mess round the edges, which is good for wildlife”. Kate’s work for the Farmer Cluster is voluntary as is some of the woodland maintenance work on the farm. The farm also shared the cost of some of the hedge planting, deer fencing and restocking of hazel and oak with East Hants AONB, before it was subsumed into the South Downs National Park in 2011. As well as financial support, advice and encouragement has been key to success. “Our local AONB ranger Nick Heasman was great to work with and hugely helpful in securing grants. Another inspiration has been our FWAG advisor Debbie Miller. She helped us with the original countryside stewardship scheme and subsequent ELS/HLS application. Having advised many of the farmers in the area Debbie is now our Farmer Cluster facilitator funded by Natural England for five years to advise and oversee the landscape scale project. William Wolmer our lead farmer in the Cluster has been another key figure as a fellow farmer who is a passionate conservationist, as are GWCT advisors Francis Buner and Peter Thompson who helped facilitate the set-up of the cluster in 2014. As well as advice on management they have taught us so much about how to read the landscape for wildlife”. Kate believes compromises can be found between the conflicts of modern farming and conservation. At one stage, they decided against having lapwing and skylark plots in the centre of the arable fields as it was too difficult to manage, but she is confident that, through good communication, most options can be accommodated. For example, you can site a beetle bank to suit the drill widths and boom length of the sprayer and all the tractors have a map of the field margins in the cab to flag them up to operators. So, if it’s possible to run a viable farming business and have space for wildlife, what stops more farmers getting involved? “I’m sure it’s a lot about time. Farming gets ever more bureaucratic with health and safety regs, employment law and so on. In the new stewardship schemes there’s more requirement to record what you are doing, adding a whole new layer of paperwork. Success relies on building a rapport, you need to trust the people you’re dealing with otherwise it becomes adversarial very quickly. We have been in HLS for eight-anda-half years and during that time we have had six different Natural England advisors. I think it is important to have continuity of advice and the ability to build a good working relationship. Another stumbling block can be inflexible restrictions and the application of penalties. Early on in our agreement we had a two-hectare field containing both birdseed and pollen-and-nectar mixes. Because we slightly miscalculated and planted more of one than the other we were penalised, even though both options paid the same”. In spite of the challenges, Kate is positive about the future for wildlife in the area. Along with the rest of the Cluster, the farm is planning to cut and lay more hedges and incorporate a supplementary feeding stewardship option where grain is spread for birds during winter months, something not yet tried on a landscape scale. They will also be learning how to do an official hare count which will help the preservation of the species in the area and work with Rotherfield to boost lapwings, the rare Duke of Burgundy and brown hairstreak butterflies and, of course, the harvest mice. Kate’s advice for fellow working conservationists: It helps to collaborate, to talk to your neighbours and to get guidance from the GWCT. It’s to do with getting advice from people who talk the same language and understand the realities of farming.